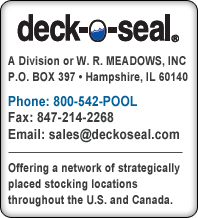 DECK-O-SEAL HS-1 SL is a one-part self-leveling pool deck joint sealant developed using SMP technology designed for horizontal expansion joints in swimming pool decks, patios, and sidewalks. It is packaged in a convenient easy to use 32 ounce pouch. Just screw on the supplied application tip and apply HS-1 SL into the joint by squeezing the foil pouch. HS-1 SL is self-leveling and does not need to be tooled. DECK-O-SEAL HS-1 SL is a one-part, self-leveling hybrid sealant, developed with silyl-modified polymer (SMP) technology. It cures under the influence of atmospheric moisture to form a medium modulus sealant with excellent adhesive properties and resistance to ageing and weathering. DECK-O-SEAL HS-1 SL can be used in movement and connection joints. Ideal applications include indoor and outdoor pool decks subject to pedestrian traffic. One part – no mixing is needed on site. Supplied in convenient pouches – no tooling or caulk gun needed. Allows movement capability of 25%. Adheres to green concrete and damp surfaces. Adheres well to most construction materials. Is permanently elastic over a wide range of temperatures. Approximate number of lineal feet that can be sealed with 32 oz. 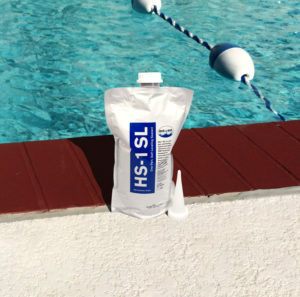 (946.4 mL) DECK-O-SEAL HS-1 SL pouch. One year from date of manufacture. Store unopened product in a cool, dry place under 80° F (27° C). Times listed above may vary depending on temperature and humidity during and after application. Surface Preparation … Surfaces must be clean, free of oil, grease or rust and of sound quality. Remove all loose particles or residues with a jet of compressed air, sandpaper, or hard brush. Glass, metal, and other non-porous surfaces must be free of any coatings and wiped clean with solvent. Priming … For optimum adhesion and/or joints over 1″ in width, P/G PRIMER, is recommended. Cleanup … Clean tools with solvent or alcohol immediately after use. Cured material can only be removed mechanically. Do not use in underwater applications.